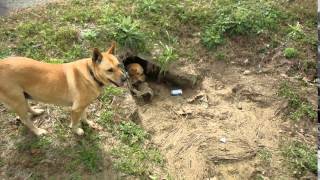 Dogs don’t care about TV unles they’re on it; culverts are much more fun. Yellow Dog was curious enough to sniff around the TV camera, but mostly they sniffed under things, laid in the dirt, and sat in the doggie fort. Here’s a video. The incessant hissing is what that tiny natural gas pipeline station for a mere 9-inch pipeline sounds like 24/7, 365 days a year. This entry was posted in Dogs, Okra Paradise Farms, Pipeline, TV and tagged Brown Dog, Dogs, Georgia, Gretchen Quarterman, John S. Quarterman, Lowndes County, Noelani Mathews, Okra Paradise Farms, Pipeline, Quarterman Road, SONAT, Southern Natural Gas, WCTV, Yellow Dog on January 29, 2016 by John S. Quarterman.